New Zealanders are known for their kiwi ingenuity and innovation. Here at OGO, quirky inventions are something we celebrate – after all, it’s how downhill ball rolling came to be! We’ve put together our favourite ten inventions that are just as quirky as our OGO ball, and are now known worldwide. Read more about these awesome inventions below – they make us proud to be New Zealanders. AJ Hackett created bungy jumping after being inspired by a tradition in Vanuatu, where he watched people jumping from wooden towers with vines attached to their ankles. Hackett then created a system of plaited elastic bands, and this invention received worldwide attention when he jumped off the Eiffel tower in 1987. He was arrested but released straight after because of the international media attention his jump received. Hackett went on to create the worlds first commercial bungy site in Ohakune in 1988. 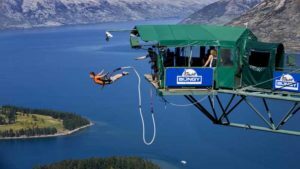 Fast-forward 30 years, and New Zealand has now become the home of the bungy with various AJ Hackett bungy sites around the country. Growing up, William Hamilton dreamed of a boat that would take him up New Zealand’s various fast flowing rivers and into beautiful remote wilderness areas. In 1954 he developed a new style of boating, with the world’s first propellerless boat. The Hamilton Jet has allowed access to rivers and waterways all over the world, and jet boat operators can be found all over New Zealand. William Hamilton also went on to invent a machine to smooth ice on skating ponds and the water sprinkler. How’s that for a Kiwi invention – we love his very kiwi, ‘number 8 wire’ thinking! Wanting to stop his horse from scratching himself on the family car, Hamilton farmer Bill Gallagher electrified his family car. Every time the horse touched the car it triggered a current and the horse got an electric shock. The horse quickly learnt to leave the car alone. 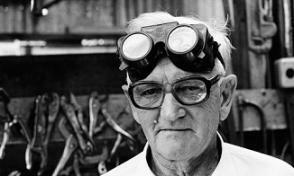 Bill then developed his idea and invented the electric fence in the 1930’s, starting by constructing fences for his neighbours. A man of many talents, Ernest Godward invented the Eggbeater in 1900. The eggbeater prepared eggs for a sponge cake in 3minutes; previously it would take 15minutes – making it so much quicker to whip up the humble kiwi pav! Godward also invented the spiral hairpin and a burglar-proof window. Located just down the road from us at Velocity Valley is the shweeb. 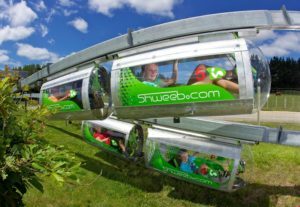 Invented by cyclist Geoff Barnett, the shweeb is the world’s first human powered monorail racetrack. The plastic shweeb pods are suspended by metal rails on a dual 200m track where you can race friends and family. With seven gears you can reach speeds of up to 45km/h! New Zealander William Atack became the first sports referee in the world to use a whistle to stop a rugby game in 1884. Previously referees would have to raise their voices to stop and control games, which was exhausting! The use of the whistle was such a success it was used around the country and eventually the rest of the world. Glenn Martin had a dream to change the way the world recognises flying. Thirty years later Martins dream came true when he started selling his Jet Pack in 1998. Ten years later his company Martin Jetpack was founded. 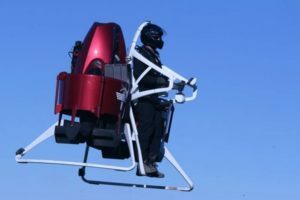 The Martin Jetpack is known as one of the easiest aircraft to fly either with or without a pilot. Now a worldwide phenomenon, Dr Keith Alexander came up with the idea for the Springfree Trampoline in the 1980’s. He wanted to buy his daughter a trampoline, but his wife said they were too dangerous. As an engineer he thought he could come up with something to make the trampoline safer. The Springfree Trampoline is said to have reduced trampoline injuries by up to 80%. 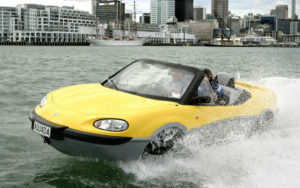 New Zealand inventor Alan Gibbs created the world’s first high speed amphibian vehicle. The Aquada converts from a car to a boat seamlessly with the touch of a button. A year after its release in 2003, Richard Branson drove one of his vehicles and broke the record for an amphibious crossing of the English Channel. The disposable syringe as we know it was invented by Pharmacist and veterinarian Colin Murdoch. Not wanting to risk the spread of infection with reusable glass syringes, Murdoch designed and created the disposable syringe. However, it took years before his concept was accepted and used around the world. Us kiwis are a creative bunch! When it comes to quirky kiwi inventions, it’s pretty hard to beat our OGO. Come and see for yourself how fun it is to roll down a hill in a giant inflatable ball.